Your cocktail attire suit needs to be tailored. You can definitely buy any suit off the rack, assuming it fits you well, but most guys need to bring their suit into the tailor. Tailoring a suit takes around a week, so make sure to save enough time before your event. When choosing colors, black is acceptable, but a bit more conservative. Great color choices for all seasons are navy or grey. 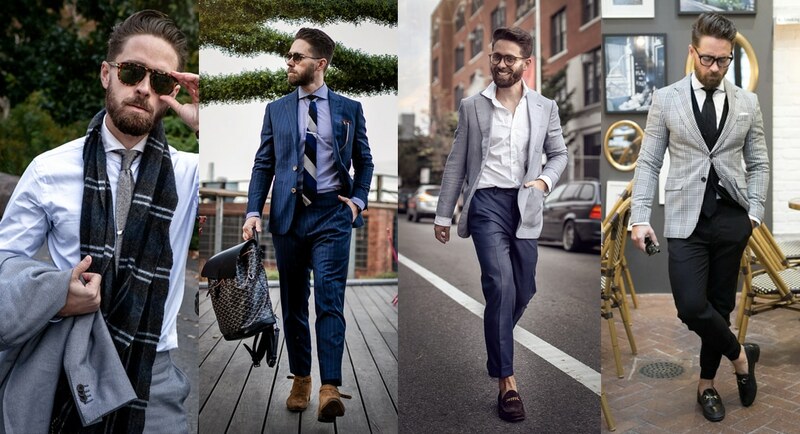 For summer cocktail attire, light grey and lighter blues or khakis look great. For winter, dark grey is an excellent choice. Summer also gives you a chance to wear more bold patterns and colors that go with the blooming flowers of the season. For prints, make them subtle. 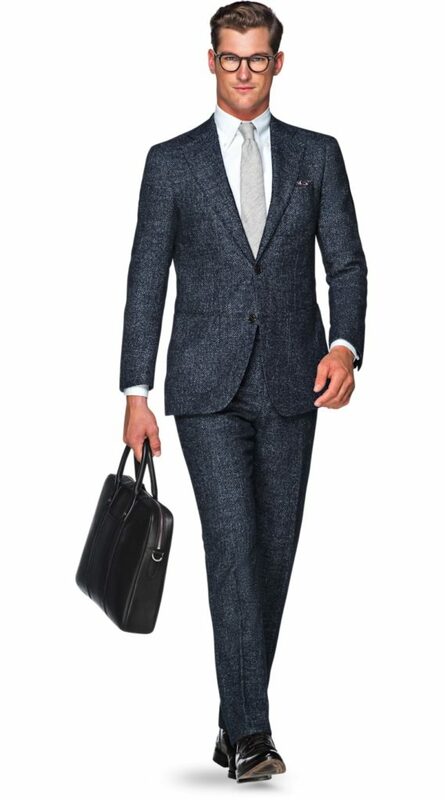 Stay away from pinstripes, and instead opt for a windowpane or a herringbone to add some texture. You don’t want your shirt to stand out too much, so stick with basic colors like white, blue or a muted gray. Make sure your shirt collar is crisp, sharply pressed, and stands up. I like a spread collar, which really shows off your tie, but make sure the collar looks good on you as this is not good for guys with really big necks. French cuffs can be too formal for daytime events, but feel free to dress them with a refined cufflink for evening affairs. If you’re looking for a great option when it comes to shirting, we reviewed Proper Cloth, which is by far the best custom shirting company we’ve come across. When in doubt, wear a tie. Since this is a more casual event, you can experiment with prints, weaves, and less formal plain ties. If you’re on top of your sartorial game, however, feel free to skip the tie. Just pair your suit with a shirt that’s designed to be unbuttoned, and you’re good to go. Since this is a cocktail event, you can keep your patent leather brogues in the closet. A loafer is designed to be functional (for driving your race car), as well as comfortable, and it’s a perfect option for any cocktail attire. Monk straps in suede bring a normally formal shoe into the casual realm. If you want to be even more wild, unbuckle the second buckle for more swagger. A classic brogue with a beautiful patina can really class up any outfit. We like them in brown to be less formal than an all-black version. For daytime events, if you don’t plan on wearing a tie, make sure to wear a casual blazer and pants (separates) along with a shirt designed to be unbuttoned. It looks sloppy if you just wear your work suit and shirt without a tie. For an evening event, if you don’t want to wear a tie, it’s best to wear a dark suit, with a white shirt in a classic slim fit. When choosing ties, try to incorporate textured ties with an interesting weave or crochet style. Patterns are also acceptable, and you can even wear wilder colors (as long as your jacket is more muted). Also be careful going too skinny on your ties, it’ll look too informal. Pocket squares are a chance to showcase a little bit of personality if the rest of your attire is muted. If you are wearing a more adventurous tie, then pair it with a simple pocket square, and vice versa. When folding your pocket square, have the style of the fold match the personality of the rest of your outfit. If you’re going casual, then go for the four peaks pocket square fold. Your wardrobe should consist of two belts. One belt in brown and one belt in black. Each belt should be well made, and designed to last a lifetime. Do your best to match your belt to your shoes. If your belt doesn’t match your shoes, then skip the belt. It’ll make the outfit more relaxed. Just like belts, your watch collection should be short and sweet. For your cocktail attire outfit, avoid wearing any watch with a cloth strap, and go for a leather or brushed metal band. If you’re wearing a gold tie bar, try to wear a gold watch, and apply this to any of your accessories. When it comes to socks, match the sock color to the color of your trousers. If you’re more sartorial, then experiment with matching your socks to your tie, pocket square, watch etc. And unless the event is 90+ degrees, always wear socks that are calf-length, to avoid showing any skin. To make an otherwise normal outfit dapper, a well placed tie bar or a pair of cufflinks adds an excellent statement piece that adds class without drawing too much attention. A men’s outfit is never complete until he applies his signature scent. Go for a clean scent, something with a vetiver note in it. ◉ When wearing a suit, a pair of white socks is big no-no. Go with a tonal or patterned pair to blend in with the colors of your suit. ◉ The color of your socks should match the color of your pants. It’s better if the sock color is darker or lighter than your pants. Don’t match the colors exactly.